Run the latest stable OS release and patches on container hosts. Unlike VMs, containers share host OS resources and files, so a security issue could affect the entire Docker estate. OS management isn’t difficult for enterprise IT teams, but approach with caution — review all documentation prior to committing an update for Docker hosting systems. Virtual snapshots are a useful tool for this process, providing a log of changes and a rollback target if needed. 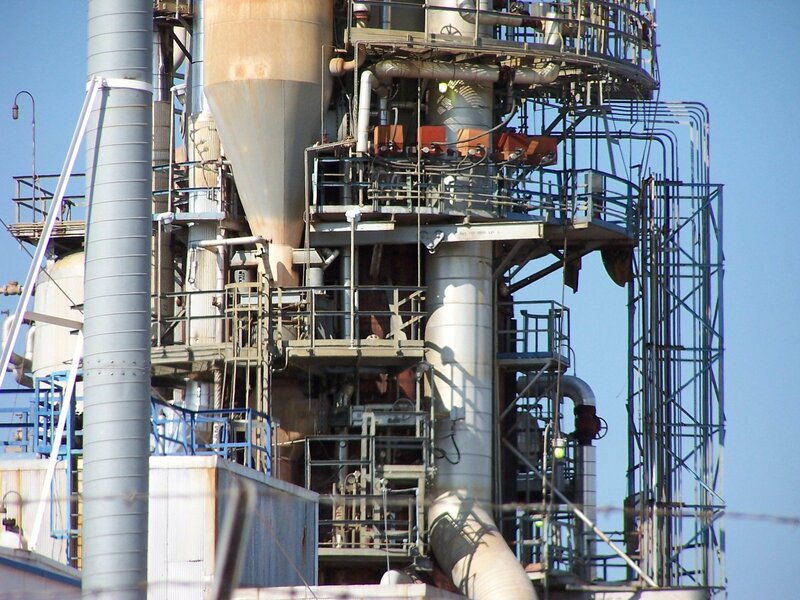 Application security is only as good as what’s on the stack below it. Assess the security settings on the host in question. Anyone with administrator-level access to the OS can manipulate the containers in the default configuration. Administrators should use keys for remote login to increase the environment’s security level. In addition, implement a firewall, and restrict access to only trusted networks. Keep the attack surface to a minimum. This is the first in a series of articles that consider the role of Kubernetes and application servers. Do application servers need to exist? Where does the current situation leave developers trying to choose the right path forward for their applications? By now you’ve likely read “Why Kubernetes is The New Application Server” and you might be wondering what that means for you. How does it impact Java EE or Jakarta EE and Eclipse MicroProfile? What about application servers or fat JARs? Is it the end as we’ve known it for nearly two decades? In reality, it doesn’t impact the worldview for most. It’s in line with the efforts of a majority of vendors around Docker and Kubernetes deployments over the last few years. In addition, there’s greater interest in service mesh infrastructures, such as Istio, and how they can further assist with managing Kubernetes deployments. All these factors are drivers for the current trends within development—pushing more concerns traditionally associated with development down into the lower layers of the entire stack, with concerns moving into infrastructure or the operating environment an application runs on. Throughout the series, we will see that there is no need for doom and gloom. Although the mechanisms might change, there’s still a place for application servers and fat JARs when developing applications. Container networking is a fast moving space with lots of different pieces. In a session at the Open Source Summit, Frederick Kautz, principal software engineer at Red Hat outlined the state of container networking today and where it is headed in the future. Kautz explained the containers make use of the Linux kernel’s ability to allow for multiple isolated user space areas. The isolation features are enabled by two core elements cGroups and Namespaces. Control Groups (cGroups) limit and isolate the resource usage of process groups, while namespaces partition key kernel structures for process, hostname, users and network functions. Microsoft’s Azure cloud platform has suffered a massive outage that affected customers in various parts of the world, with cooling problems being identified at about 2.30am Pacific Time on Tuesday (7.30pm AEST Tuesday). I was at Open Source Summit last week (full trip report forthcoming) and like always one of the keynotes was Linus being interviewed by Dirk Hohndel. The topic of the kernel community and community management came up and whether Linus thought the kernel needed to do anything more to grow. Paraphrasing, his response was the success of the kernel community shows that it’s generally doing fine. I disagree with some aspects of this and have actually thought a lot about what community management would mean for the kernel. The role of the TAB in community management is an interesting one. If you look at the description on that page, “The Technical Advisory Board provides the Linux kernel community a direct voice into The Linux Foundation’s activities and fosters bi-directional interaction with application developers, end users, and Linux companies.” I know there are some unfavorable opinions (and conspiracy theories) out there about the Linux Foundation. What the Linux Foundation does well is help guide corporations in doing open source which is very different from grassroots free software. There’s a large number of companies who have become very active members of the kernel community thanks to guidance and support from developers like those who are on the TAB. Enabling companies to contribute successfully is a form of community building as a practicality; companies have different needs and requirements than individuals. I do believe the members of the TAB deeply care about the kernel community, including those who aren’t part of any corporate entity. Figuring out how to set that direction may be less obvious though. Merged today into systemd is basic keydev support for cryptsetup-generator to allow unlocking an encrypted drive by using a key file that is stored on an external drive. The Dracut initramfs framework has already supported unlocking encrypted drives by relying upon a key file stored on an external HDD/SSD. But until now systemd hasn’t supported key files being on external block devices (keydev). The newly-added support to systemd allows specifying a keydev block device based upon its UUID and a path to the key, using the added luks.uuid boot parameter. Greg Kroah-Hartman has rolled out a batch of stable kernel updates today including Linux 3.8.121, 4.4.154, 4.9.125, 4.14.68, and 4.18.6. Linux 4.18.6 is notable in that the Threadripper 2 CPU temperature reporting is in place for those using 4.18 stable rather than 4.19 Git. That should be all good for the now-shipping AMD 2950X and 2990WX processors. The next long-term supported Linux kernel series was revealed recently as Linux 4.19 by the long-time Linux kernel developer and maintainer Greg Kroah-Hartman. Now that Linux kernel 4.17 has reached end of life and the recently released Linux 4.18 kernel doesn’t look to have what it needs to become an LTS (Long Term Support) branch, the LTSI (Long-Term Support Initiative) community reached out to Greg Kroah-Hartman to know what the next LTS Linux kernel series will be. And the answer is yes, the upcoming Linux 4.19 kernel will be an LTS (Long Term Support) series, supported for at least a couple of years after its initial release. At the moment, there are five long-term support Linux kernel branches, namely Linux 4.14, Linux 4.9, Linux 4.4, as well as Linux 3.16 and Linux 3.18. Changbin Du from Intel recently posted some code to increase the range of the function tracer by increasing the number of function calls that were actually compiled into the kernel. Not all function calls are ever actually compiled—some are “inlined”, a C feature that allows the function code to be copied to the location that calls it, thus letting it run faster. The downside is that the compiled binary grows by the number of copies of that function it has to store. But, not all inlined functions are specifically intended by the developers. The GNU C Compiler (GCC) also will use its own algorithms to decide to inline a wide array of functions. Whenever it does this in the Linux kernel, the function tracer has nothing to trace. Open source software programs play an important role in how DevOps and open source best practices are adopted by organizations, according to a survey conducted by The New Stack and The Linux Foundation (via the TODO Group). By implementing open source best practices, organizations are helping developers become both more productive and more structured in how they manage the often abundant open source software their businesses rely on. MoltenVK continues getting better for offering Vulkan graphics/compute support on macOS by leveraging it on top of Apple’s Metal drivers. MoltenVK 1.0.20 is out as the latest feature update to this Vulkan-over-Metal layer. MoltenVK is notably used by Valve’s Dota 2 on macOS, is becoming used by Wine, presumably will also be picked up for Windows Steam Play on macOS in the future, and so far also seems to being used by at least a few different indie game studios on macOS or iOS. This is good news for Linux users with ensuring Vulkan is a common denominator across platforms, avoiding fragmentation if VKD3D/DXVK had to be rewritten for Mac, etc. With the start of a new month comes fresh benchmarks of some of the leading rolling-release Linux distributions. For kicking off September are benchmarks of the Arch-based Antergos, Intel’s Clear Linux, and openSUSE Tumbleweed when testing on four distinctly different systems. If you are a professional desktop, laptop users of Ubuntu, Linux you should be using some productivity booster tools/apps as they are neat and free; does their job. Here are 5 such free apps for Ubuntu, Linux which you might want to give a try. Rclone is a command line program used to synchronize files and folders to and from multiple cloud storage services, including Amazon Drive, Amazon S3, Google Drive, Google Cloud Storage, Dropbox, Microsoft oneDrive, Microsoft Azure Blob Storage, ownCloud, Nextcloud, DigitalOcean Spaces, and many others (WebDAV and SFTP are also supported). The tool is free and open source software, and is available on multiple platforms, including Linux, Windows, macOS, *BSD, and Solaris. Head to stellarium-web.org right now to check out what’s in the sky above you. This is a stripped down version of the desktop and mobile version, but you don’t need to install anything. This means you can quickly reference it on any device, even one you’re borrowing. We’re happy to announce Kiwi TCMS version 5.3.1! This release brings lots of UI updates and removal of unused and/or duplicated functionality and source code. Many pages have been redesigned with the Patternfly library to have a modern look and feel which you can experience at https://demo.kiwitcms.org. LaTeX is a document preparation system and document markup language for high-quality typesetting. The system was originally developed by Leslie Lamport in the early 1980s. LaTeX is based on Donald E. Knuth’s TeX typesetting language. Lamport says that LaTeX “represents a balance between functionality and ease of use”. LaTeX is often used for technical or scientific documentation, particularly because it generates well formatted papers with beautifully crafted formulae, but the system can be used for any form of publishing. It employs beautifully crafted typesetting algorithms. Academic journals will often accept submission in this format. Using the LaTeX system leads the author to concentrate on the structure of the document rather than its appearance. The author therefore focuses on what he/she wants to say, instead of fretting over page borders, font attributes, or formatting. Moreover, the author will be guided in the organisation, structure, and flow within the document. The well-known standard for mathematical research on computers is Matlab but except for being costly, it is not always the best alternative. To solve mathematical problems and vizualise different mathematical concepts you can use many other alternatives. The ones listed below are common in both academia and industry for a wide variety of reasons. This article compares the different packages and shows how easy it is to use for projects with the GUI and with other methods. Disable plymouth and boot much faster than before! Don’t want to log out but you do want to get rid of a stored .zip file password in Windows? This will do that. Filesystems are built on top of storage devices. There are RAID controllers and disk controllers each running its own small piece of firmware. There are caches to improve performances. There are disks with different sector sizes and there are disks which would report a different sector size depending on how you ask the question. Redis is an open source in-memory data structure store that is mainly used as a caching server but can also be used as a database or as a message broker. We have already discussed about the Redis server & its installation as well as setting up Master Slave setup for Redis server in our previous tutorials. Most often when we work with servers and start to SSH them and access them via command-line, we face issues with resolving the domain names to corresponding hostnames. Luckily, manually checking this is not very difficult on Ubuntu via a very easy command-line utility known as Ping. In this lesson, we will explore the capabilities of Ping command on Ubuntu 18.04 LTS machine and see what are the commands we can use with Ping utility for various tasks. Let’s get started. In your Linux life time, you may have faced many boot issues. Like you experimented with some stuff and later you found out that you can’t boot into your precious Linux operating system at all! Boot Repair is a tool to repair common boot issues on Ubuntu, Debian, Arch, Linux Mint, OpenSUSE, Fedora and other Linux distributions, Windows and Mac OS operating systems. By default, C programs have no concurrency or parallelism, only one task happens at a time, each line of code is read sequentially. But sometimes, you have to read a file or – even worst – a socket connected to a remote computer and this takes really a long time for a computer. It takes generally less than a second but remember that a single CPU core can execute 1 or 2 billions of instructions during that time. CHOP is a fast-paced 2D arena fighting game that just recently entered Early Access. It has Linux support and there’s a demo available too. Super Indie Karts from developer One Legged Seagull is actually quite an impressive retro-inspired racing game. The latest update adds in a 25cc mode, which is better for beginners and younger gamers. Also—for me, because I’m terrible. The other modes in the game are quite fast, so this was a needed addition to ease people into it. I actually had quite a bit of difficulty before, but after practising in the 25cc mode the other modes suddenly don’t seem as stupidly difficult as before. The update does also include a tweak to make cpu kart difficulty lower, so that might also be helping a little. Still, the jump from 25cc to 50cc is quite a difference. Set inside the brain of Theo Kavinsky after waking from a coma, the FMV adventure hybrid game Headspun now has a Linux version available. The current version is classed as an Early Access build and the Linux version especially needs more testing. The developer sent a Twitter post out to mention this. Continuing on from the NVIDIA GeForce RTX 2080 expectations on Linux shared earlier this week, here’s a list of ten reasons why Linux gamers might want to pass on these soon-to-launch graphics cards from NVIDIA. The list are various reasons you may want to think twice on these graphics cards — at least not for pre-ordering any of them right away. Not all of them are specific to the Turing GPUs per se but also some NVIDIA Linux infrastructure problems or general Linux gaming challenges, but here’s the list for those curious. And, yes, a list is coming out soon with reasons Linux users may want to consider the RTX 20 series — well, mostly for developers / content creators it may make sense. The Humble Unity Bundle is now officially live and it brings with it a pretty good selection of games available on Linux. As usual, I will only note what has a Linux native version, there’s others in the bundle that are Windows-only. Promising ‘deep souls-like combat’ the challenging action RPG Mana Spark is set to release September 27th with Linux support (confirmation). Jason Evangelho has taken a deeper dive into Linux, Lies and Steam Play compatible video games. He touches on subjects such as ease of use when it comes to making Windows games run on Linux. Liam Dawe, of Gaming on Linux fame, assists Jason on his journey into gaming on the OS and it is nice to see actual sales numbers for Linux gaming from websites like Humble Bundle. Who knew that 20% of the games on Steam are now compatible with Linux? Our upgrader has been working for some time and many people have used it successfully, but as ever we wanted to prove it was correct and QA. It uses the same upgrader as Ubuntu which was written over a decade ago and has seen not much attention since. We wrote our own notifier and got translations for it. Added to the upgrader is stopping Packagekit so you don’t get notified of updates while you are already updating. We added translations to the upgrader. A test was added to make sure version numbers in bionic are greater than in xenial which turns out not to be the case for a few things so we had to add rules to deal with them and then make sure those rules got used by the upgrader. The release notes that get shown before an upgrade strangely have no translations but we edited them a bit so in English it is relevanto to neon. Stopping the screen locker during an upgrade is important too but surpringly faffy since the upgrader runs as root and the screen locker as user. This year, we participated in Google Summer of Code with three students: Ivan, Andrey and Michael. Some of the code these awesome students produced is already in Krita 4.1.1, and most of the rest has been merged already, so you can give it a whirl in the latest nightly builds for Windows or Linux. So, let’s go through what’s been achieved this year! With GNOME 3.30 released later today we look at the best new features the GNOME 3.30 upgrade has to offer. The 35th stable release of the free, open-source GNOME desktop environment, GNOME 3.30 arrives six months after GNOME 3.28 was released. With an approximate 24,845 changes in all, GNOME 3.30 offers both major new features and smaller improvements that are well worth looking out for. Available to download from today, and due to ship in Ubuntu 18.10 this October, GNOME 3.30 boasts new features, new apps, and new improvements, all of which are designed to help improve the way we use the desktop. GNOME 3.30 is releasing today as the newest feature release for this open-source desktop environment on its usual six-month release cadence. All the videos from GNOME’s GUADEC Conference 2018—which brought together free software enthusiasts from around the world and was held in Almería Spain this past July—are now available at http://videos.guadec.org/2018. With GNOME 3.30 releasing today, the GNOME release team has already finalized the release schedule for the next development cycle. GNOME 3.32 is the next update and with the usual six-month release cadence that obviously means another March release. The ratified schedule for GNOME 3.32 puts its release date as 13 March. For making that happen, the GNOME 3.32 betas begin on 6 February, which marks the UI/feature/API/ABI freezes and the hard code freeze with the first release candidate on 6 March. The first development milestone is GNOME 3.31.1 that is set to come out on 10 October. We are pleased to announce the launch of Nitrux 1.0.15. This new version brings together the latest software updates, bug fixes, performance improvements and ready-to-use hardware support. Nitrux 1.0.15 presents an updated hardware stack, among other things. The recently included Linux kernel 4.18.5, as well as an updated graphics stack, adds support for newer computers and hardware in Nitrux. In addition, new patches for system vulnerabilities are included in this release, so you can rest assured that you are using the most secure version of Nitrux. After installing Nitrux 1.0.15, you will have the latest versions of many pre-installed software packages. That means that you will need fewer software updates after installing Nitrux on your computer. On the 22nd there was no action from my side; the service recovered itself. I did have monitoring configured and I received email alerts, but I have not noticed them. On 23rd I have immediately seen the service was down and I’ve rebooted the machine. I have spent a significant amount of time trying to determine if a specific request caused this, but it seems likely that it was just an overload, although I have not proved this theory. Cloudera launched an open source Internet of Things (IoT) architecture for enterprises in collaboration with Red Hat and Eurotech. This modern IoT architecture is scalable, secure, and technologically advanced without vendor lock-in, Cloudera said in a press release. The architecture is based on open standards and is integrated, flexible and runs on multi- or hybrid-cloud environments. This architecture is designed to provide the foundational components that organisations need to quickly and securely roll out IoT use cases. Cloudera, Inc. (NYSE : CLDR ), the modern platform for machine learning and analytics optimized for the cloud, today announced the launch of an end-to-end, open source Internet of Things (IoT) architecture in collaboration with Red Hat and Eurotech. Enterprises now have a modern IoT architecture that is scalable, secure, and technologically advanced without vendor lock-in. Recently, we heard a company say that they wanted to move all of their applications from Virtual Machines to Containers because they no longer wanted to do patching of Operating Systems. This got us thinking. Would that move completely eliminate the need to patch Operating Systems, since Containers are Linux and there are still Operating Systems running on the container hosts? Cloudera has launched an open-source, IoT architecture in collaboration with Red Hat and Eurotech. According to the press release, this end-to-end architecture is “based on open standards and is integrated, flexible and runs on multi- or hybrid-cloud environments”, and it’s “designed to provide the foundational components that organizations need to quickly and securely roll out IoT use cases”. Both members of the same family of RPM-based Linux distributions, CentOS and Fedora share many similarities, but they are far from interchangeable. In this article, we introduce where both of these popular Linux distributions come from and explain what they have in common and what makes them different. Good things come to those who wait. I always wanted to improve our Java Packaging documentation a little. When I started to contribute to Debian Java in 2012, I often struggled to find the right information and examples that would explain how I could package my own libraries or applications for Debian. After six years of trial and error and helpful advice on the debian-java mailing list, I figured it would be time to document this journey. Despite the fact that some upstream projects come without a proper build system, they are often very simple to compile. Instead of one or two source files, you just have to compile dozens in one single directory. We have a Java helper tool called….Javahelper that does exactly that for you. A good start is to read the docs at /usr/share/doc/javahelper/tutorial.txt.gz also replicated here. Of course the Java world has invented the most powerful build systems in existence that are even able to bend light and can throw galaxies around. Let’s welcome Ant, Maven and Gradle. Everything else is irrelevant but don’t trust me. As of now there are no point releases in this LMDE distribution. Other than bug fixes and security fixes, the Debian base packages stay the same as the previous one. But Mint and the desktop components are constantly being updated. When they are completed, the freshly advanced features will be incorporated directly into LMDE as they are deployed for the next Linux Mint release. Canonical is looking for committed volunteers that own a computer with a dedicated Nvidia graphics card to test drive both the Nvidia proprietary graphics drivers and the open-source Nouveau graphics driver on both the Ubuntu 18.04 LTS (Bionic Beaver) and the upcoming Ubuntu 18.10 (Cosmic Cuttlefish) releases and report any issues they might encounter. “We are looking for committed volunteers to test Nvidia with proprietary and open source drivers. The goal of this testing is to catch regressions early in the cycle, and fix bugs before they reach a major audience. It is for Ubuntu 18.04 (Bionic) or Ubuntu 18.10 (Cosmic), in laptop or PC machines,” said Will Cooke, Ubuntu Desktop Director at Canonical. Web Browsers are one of the most widely used application software by millions of users worldwide. Ubuntu comes pre-loaded with Mozilla Firefox web browser which is one of the best and popular browsers alongside Google’s Chrome web browser. Both have their own set of features which make them different from each other. There are many web browsers available in the market according to the taste of internet users. Some users prefer fast web browsers while some prefer secure ones. Ubuntu users don’t need to worry as we have got you covered. In this article we are covering the 11 best web browsers which can be used on Ubuntu and other Linux distros. If you are looking for fastest browser, browser for web development or a secure web browser where you can block ads then you are at right place. Tired of same look and design of your Ubuntu desktop over the years? And looking to give a fresh look to your Ubuntu desktop? Then you’re at the right place. Because today we’re going to cover 10 best icon themes which will give your Ubuntu desktop a new look. Changing icon theme is the best and most easy way to give a new fresh look to Ubuntu desktop. The folks at the Linux-friendly CompuLab hardware vendor have introduced WILD, the first WiFi RTT access point to allow for WiFi indoor location detection/tracking with supported Android 9 smartphones. CompuLab WILD is able to deliver under 0.5 meter accuracy. WiFi RTT is the standard for real-time, accurate indoor location tracking. CompuLab’s Wi-Fi Indoor Location Device (WILD) is the first RTT-enabled access point using Intel 8260 Wireless-AC and dual Gigabit Ethernet for the traffic handling. Compulab has launched a Fitlet 2-based “WILD” Wi-Fi RTT access point for real-time indoor location of Android 9 “Pie” phones with 1-2 meter accuracy. WILD devices can find each other at half-meter accuracy. One of the interesting new features in Google’s latest Android 9 “Pie” release, which was announced a month ago, and which today was posted for download onto Pixel phones, is its support for Wi-Fi RTT (round-trip-time) indoor location technology. Now Compulab has launched the Wi-Fi Indoor Location Device (WILD) computer, which it calls the first Wi-Fi RTT access-point that enables WiFi-based indoor location for Android 9 smartphones. Ultimately the SonOff is better technically – the use of an ESP8266 directly on the device means you get a direct secure MQTT/TLS connection rather than an easily sniffable/clonable 433MHz signal, plus it’s bidirectional so you can be sure the device is in the state you think it is. However I had these switches lying around and a spare Digispark so the only expenditure was a couple of quid for the transmitter/receiver pair. Plus it was fun to figure it out and end up with a useful result, and some of the information learned will be useful for controlling my heating (which is on a 433MHz thermostat). E-con’s “TaraXL” stereo vision camera works with Nvidia’s Linux-driven Jetson TX2 module and other Tegra based systems to stream 3D depth maps with 752 x 480 resolution at up to 50fps over USB 3.0. E-con Systems’ TaraXL is designed for stereo vision imaging applications including autonomous driving, robotics, drones, mixed reality applications, people detection/counting, stock level monitoring, volume measurements, and proximity warning systems. Like the very similar, two-year old Tara camera, the TaraXL has a USB 3.0 interface and is built around a pair of OnSemi 1/3-inch MT9V024 CMOS image sensors, which enable WVGA Global shutter monochrome image capture. The main difference is that the TaraXL SDK is five times faster than the Tara SDK, claims E-con. Purism, the social purpose corporation which designs and produces popular digital rights respecting hardware, software, and services, is sharing the much anticipated progress and scheduling for its Librem 5 smartphone. As you might have noted when we announced closing the development kit “last call” sale, new specifications have been made public. I want to explain what led to these specifications and why we made the choices we made and what the current timeline is for the devkits and Librem 5 phones. We want to make a secure mobile communication device which can offer on-par experience similar to today’s smartphones, while making it as free and transparent to the extent we can given the reality of today. We take the notion of “free” or “libre” seriously, striving to comply with the Free Software Foundation (FSF) strict “Respects Your Freedom” (RYF) requirements. Having that endorsement is an important and critical goal for us. The RYF criteria rules out a substantial amount of hardware, making finding RYF complaint phone hardware a challenging endeavor. It would have been relatively trivial to produce a smartphone with non-free GPU drivers and a CPU with combined radios + CPU + GPU in a few months, but creating a regular smartphone is not our goal. We have much higher aspirations. In the open source hallways, Purism’s Librem 5 Linux smartphone has created a lot of buzz over the course of past one year. To keep the open source enthusiasts informed about the ongoing progress, the development team keeps posting regular updates on its blog. In a recent development, the team has confirmed that Librem 5 isn’t going to be released in January 2019, which was the original release date. Purism, a maker of Linux-based laptops, has hit a hitch with its forthcoming Linux smartphone, which will delay production by three months. Purism’s crowd-funded smartphone, the Librem 5, had been scheduled to ship around January 2019, but the company now says it expects a delay in production until April 2019. The reason is a silicon bug in the system on chip that caused “extreme” battery drain. By extreme, Purism means the device would have had a battery life of just one hour. How To Get Android 9 Pie Features On Your Old Android Right Now? September 5, 2018 Xiaomi has officially launched Redmi 6, Redmi 6 Pro and Redmi 6A for Indian users at an event in New Delhi. Hasura, a company that creates tools for developers on top of the popular Postgres database, is introducing a new product in public Alpha today aimed at helping programmers build serverless apps more quickly and efficiently. The idea is to simplify function writing by offering an open source event system on top of Postgres to trigger events when certain conditions are met in the underlying database. This should help reduce the amount of coding needed to make something work, while also driving a more scalable system. Typically, programmers string together a series of API calls to services to take care of different parts of an app such as calling a payment or communications gateway. This saves the programmer from having to create the various pieces from scratch. The problem is that if anything goes wrong in the middle of a string of calls, the system can break down and typically has to start over. Storj Labs launched an open source partner program that will divert revenues from its unique decentralized cloud storage platform to companies and individuals willing to house data on their computing systems. Storj Labs Executive Chairman and Interim CEO Ben Golub told attendees during a keynote address at the recent Open Source Summit event that this model will help drive economic growth and innovation in the open source space. It’s also an aggressive step toward monetizing and diversifying the cloud storage space. Google Chrome is the go to browser for most people. With a simple UI and great performance, it has been the most dominant browser for quite sometime. Today Google dropped a big update for Chrome, on it’s 10th Birthday. There are a lot of changes, including a UI revamp, a new password manager and more. While Firefox is hitting version 62 this week, Google has introduced Chrome 69 as the newest version of their cross-platform web-browser that recently celebrated its tenth birthday. With this Chrome 69 browser update there is a visual refresh to the user-interface as Google developers adopted the Material 2 design principles for the desktop browser. Chrome 69 also has various security improvements, CSS conic gradients support, CSS scroll snap positions, and various other developer additions. Google is celebrating Chrome’s ten-year anniversary with a slick new theme, but there’s another big new change. The familiar green lock and “Secure” indicator in the address bar are going away. Web users around the world have been trained to look for the green lock and the “Secure” wording before entering a password, credit card number, or other private information. The word “Secure” indicates the connection is encrypted with HTTPS security, preventing any snooping or tampering. With Chrome 69, released on September 4, 2018, the word “Secure” is gone and the lock icon turns from a bright green into a monochrome gray. Just a few days after celebrating its 10th anniversary, Google Chrome’s new edition is here. Today, Google launched Chrome 69 that introduces a revamped user interface, an improved password manager, and a powerful Omnibox amongst many other changes. While Mozilla isn’t expected to officially announce Firefox 62.0 until tomorrow, as usual the binaries are available for wanting this web browser update right now. Firefox 62.0 delivers support for CSS Variable Fonts, easier clearing of site data/cookies, text-to-speech on Firefox for Android via the Speech Synthesis API, several bug fixes pertaining to Wayland support although the Wayland support doesn’t appear complete yet, WebExtensions API additions, easier toggling of tracking protection items, and various other minor improvements. In future versions of Firefox, the browser will display recommended browser extensions that are related to the site that a user is visiting. These extension will provide extra functionality to the site such as enhancing search functions, protecting a user’s privacy, or performing some other behavior. This new feature is called Contextual Feature Recommender, or CFR, and will recommend extensions that Mozilla feels would be beneficial to users of various sites. Currently this feature is only available in the Firefox Nightly builds, but is expected to be rolled out in Firefox 63. The feature, called Contextual Feature Recommender, is currently only available in Nightly builds, but will roll out with Firefox 63 in October. The idea is that Firefox can point out potentially helpful extensions that are relevant to the site you’re currently browsing. The latest versions of Firefox for desktop, Android and iOS launched today. Since our last release update, we’ve been working on a couple improvements and laying the foundation for upcoming future releases. To get the details on what’s new with today’s release, check out the release notes. In the coming months, we’ll unveil and share new features that help people feel safe while on the web, and worry less about who’s collecting their personal data. You can read more about it in our blog post where we talked about our approach to Anti-tracking. This week’s crate is cgroups, a native Rust library for managing control groups under Linux. It has been argued that users are not sophisticated enough to reason about this subject and that the DNS move should happen by default, with an opt-out for those that care. Another idea that has been raised is a startup dialogue that proposes a more secure [I]nternet experience and a ‘Got it!’ button. This clearly does not go far enough in educating users about the change they will be authorizing. Mozilla has recently announced a change in our approach to protecting users against tracking. This announcement came as a result of extensive research, both internally and externally, that shows that users are not in control of how their data is used online. In this post, I describe why we’ve chosen to pursue an approach that blocks tracking by default. People are uncomfortable with the data collection that happens on the web. The actions we take on the web are deeply personal, and yet we have few options to understand and control the data collection that happens on the web. In fact, research has repeatedly shown that the majority of people dislike the collection of personal data for targeted advertising. They report that they find the data collection invasive, creepy, and scary. The web doesn’t have to be boxy. Historically, every element in a page is rendered as a rectangle of some kind, but it doesn’t have to be this way. With CSS Shapes you can create web layouts every bit as stylish as print magazines, but with all of the advantages of the web. Crunchy Data — the leading provider of trusted open source PostgreSQL technology, support, and training — announces its expanded commitment to providing open source geospatial data management and analytics engineering and support by welcoming Paul Ramsey, Chair of the PostGIS Project Steering Committee and PostgreSQL Major Contributor, to its team of open source contributors. Developers who use GitHub – 28 million at last count – now have the option to edit code with the click of a button using Gitpod, an integrated development environment (IDE) that can be launched directly from the social code hosting site. Based on Theia, an open source cloud-and-desktop IDE developed by Ericsson, IBM, TypeFox and RedHat, Gitpod can be invoked by prefixing a GitHub URL with “https://gitpod.io#” or using a Chrome browser extension. Open-source farming could challenge Big Ag and take crop production to a new heights. Harper’s big idea, a project he called the Open Agriculture Initiative, was to unleash the innovative power of the internet on agriculture by means of wetware — tech that merges edible plants with silicon chips. Empowered with free, open-source software and food computer designs, he argued, we could all soon be experimenting with crops, sharing our discoveries, and fixing environmental problems. Imagine reducing our dependence on centralized Big Agriculture and growing more food more sustainably by bringing the farm into the home — or at least into the city limits — and building a distributed network of a billion nerd farmers. While yesterday we looked at the Renegade ROK-RK3328-CC Libre Computer Board, they already have the successor well in the works. The Renegade was interesting as for just dollars more than the Raspberry Pi it offers better performance, Gigabit Ethernet makes the networking potential a lot more than the slow Ethernet on the Pi, there is USB 3.0 connectivity, and its using DDR4 memory, among other technical advantages. But the new Renegade Elite even puts that to shame. There’s been AMD Radeon code in the works for the GCC compiler as a new back-end going back years but never really seems to takeoff in comparison to the AMD support on LLVM. SUSE formerly worked on a lot of Radeon + GCC code for GPU offloading while more recent Code Sourcery has been working on a new AMD GCN back-end. The newest AMD GCN code was posted today for the GNU Compiler Collection. GDB 8.2 is out today as the latest feature update for this GNU source-level debugger for many languages, architectures, and operating systems. Notable to GDB 8.2 is that it adds a RISC-V ELF target for this open-source processor ISA. Meanwhile, GDB 8.2 drops support for m68k on OpenBSD and SH-5/SH64 support across various operating systems. LibrePlanet is an annual conference for free software users and anyone who cares about the intersection of technology and social justice. For a decade, LibrePlanet has brought together thousands of diverse voices and knowledge bases, including free software developers, policy experts, activists, hackers, students, and people who have just begun to learn about free software. LibrePlanet 2019 will feature sessions for all ages and experience levels, including newcomers. Sharon Woods, general counsel for the Defense Digital Service (US Department of Defense) said, “Last year was my first LibrePlanet… I walked away a complete believer in free software.” In just the last three years, over a thousand people from around the world have attended LibrePlanet, with many more participating online by watching the free software-powered livestream, joining the conversation on IRC, or viewing nearly 40 hours of archived video on the FSF’s GNU MediaGoblin instance. LibrePlanet 2019′s theme is “Trailblazing Free Software.” In 1983, the free software movement was born with the announcement of the GNU Project. FSF founder Richard Stallman saw the dangers of proprietary code from the beginning: when code was kept secret from users, they would be controlled by the technology they used, instead of vice versa. In contrast, free software emphasized a community-oriented philosophy of sharing code freely, enabling people to understand how the programs they used worked, to build off of each other’s code, to pay it forward by sharing their own code, and to create useful software that treated users fairly. The DDS is part of the U.S. Digital Service (USDS), which embeds developers inside of U.S. government agencies as part of an effort to advance the state of technology development and usage. The USDS got started in the waning months of the Obama administration in late 2016 and has been continuing its work ever since. “The U.S. Digital Service is a SWAT team of nerds,” Kasper said. On the first day of class, Simon Fraser University student Joey Mitchell spent about $200 on textbooks — and that’s just for one course. As Mitchell and other post-secondary students across B.C. head back to class this week, the British Columbia Federation of Students is calling on the province to invest an extra $5 million in a program that is trying to make prohibitively expensive textbooks a thing of the past. Eleven European funding organizations announced today (September 4) an open-access initiative that requires grantees to make resulting research articles free to read as soon as they are published. The initiative is slated to begin in 2020. Coming some three years after the release of Babel 6, the update is said to be faster, allow for easier upgrades, boost configuration functionality and add support for technologies such as JSX Fragments and TypeScript, among many other things. Resolution 399/2018 was granted taking into account the thousands of Chileans infected by hepatitis C and the barrier to treating them all with the required drugs that is marketed in Chile at an unaffordable price by Gilead. The hepatitis C treatment with sofosbuvir, because of the price, until last year was excluded from the publicly funded drugs provided by the Ministry of Health. And after a big campaign from patients, it was included, but only for 350 patients, excluding the thousands of others in need. After President Piñera took office, and with the swinging from a left-oriented government to one on the right, Gilead and Pharma displayed a number of lobbying efforts, ranging from expensive law firms in Chile to calls to foreign governments, to invalidate the declaration of public health need for a compulsory licence. Among these efforts, Gilead lawyers presented a reconsideration request to the Ministry of Health arguing it did not meet legal grounds, particularly because it was taking into account the price of the drugs as part of the justification. Innovarte Ngo, who started the process in Chile for the declaration of public health need at the Ministry of Health, and Giorgio Jackson, member of the Chilean Congress who has led the support for it from Congress, rebutted Gilead’s allegations. They raised the freedoms granted in World Trade Organization Agreement on Trade-Related Aspects of Intellectual Property Rights (TRIPS) as well as in the Doha Declaration on TRIPS and Public Health, and asked the ministry to upheld the declaration. I recently had the “pleasure” of helping a friend with his GNU/Linux box which was acting up. Random system processes like initctl, dbus-daemon,ssh-agent, ibus-x11, icc-daemon or even a simple sleep would suddenly consume all the CPU resources in the background, often the graphical user interface would also lag. But he couldn’t find out why – every time he tried to debug the issue, e.g. by running top, the processes at fault suddenly disappeared. Turns out he had infected his machine with the Linux/CoinMiner.BC malware, probably by installing an unofficial Kodi plugin. Luckily all the malware seems to do is to mine some cryptocurrency in the background (hence the name “CoinMiner”). But it takes quite a few steps to avoid detection and ensure it isn’t easily removed. In theory you could log out of all user sessions, log in as root (NOT via sudo! ), kill all remaining user processes and then clean/remove the listed files. Creating a new user profile, migrating all the data you actually need and then deleting the old profile is theoretically much better. In practice your machine was compromised and you don’t know if the attackers did more than just infect it with a cryptominer. They could have used any number of security exploits to install a rootkit or something like that. Just backup your data and reinstall the whole machine. The C language is very powerful, widely used—particularly in the Linux kernel—and very dangerous. One of the Linux engineers outlines how developers can cope with the programming language’s security weaknesses. You can do almost anything with C, but that doesn’t mean you should. C code runs quickly, but it has no safety belt. Even if you’re a C expert, as are most of the Linux kernel developers, you can still make killer blunders. Besides the pitfalls of, say, misusing pointer aliasing, the C language itself has fundamental, unfixed bugs that await the unwary. It’s those weaknesses that Kees “Case” Cook, Google Linux kernel security engineer, addressed in a seminar at the Linux Security Summit in Vancouver, Canada. It seems that Google has updated its latest operating system versions Android P and 9 to mitigate this security vulnerability but there is no news yet on whether the company intends to resolve the issue in older versions of the operating system as well, and if so, when. Researchers are still looking into this vulnerability to discover whether any other operating systems are affected or whether the concept is being used to exploit random devices remotely as well. Last week, James Carter and Stephen Smalley presented the architecture and security mechanisms of two operating systems, Zephyr and Fuchsia at the Linux Security Summit 2018. James and Stephen are computer security researchers in the Information Assurance Research organization of the US National Security Agency (NSA). They discussed the current concerns in the operating systems and their contribution and others to further advance security of these emerging open source operating systems. They also compared the security features of Zephyr and Fucshia to Linux and Linux-based systems such as Android. The source code for the winners of the 25th IOCCC has been released. ana Del Rey has pulled out of the headline slot of the Meteor Festival in Tel Aviv, a week before she was due to perform. Del Rey is the highest profile act to have withdrawn from the festival, following pressure from Boycott, Divest and Sanctions (BDS) campaigners. Concert cancellations grow by the day, as one by one, artists align in solidarity with the Palestinian movement. A total of 15 performers have joined the international campaign to boycott Israel’s Meteor Festival, the Boycott, Divestment and Sanctions (BDS) confirmed Monday just a few days after U.S. pop singer Lana Del Rey, the festival’s main guest, announced she was not attending the concert in a big victory for pro-Palestinian activists. This is the second time the “Summertime Sadness” songstress canceled a scheduled show in the Holy Land due to pressure from the BDS movement, which calls for “boycott, divestment, and sanctions” against the Jewish State. The pop star blamed the fact that she couldn’t book a venue in “Palestine” for the cancellation. For back-to-school week, we tasked MuckRock readers with combing through the Central Intelligence Agency archives to find the strangest tie between your alma mater and the intelligence community. Here’s what you found! Last week, via a memo endorsement, Judge Koeltl granted the Democratic National Committee’s motion to serve Wikileaks by Twitter in the DNC’s case over the 2016 election hacks (see our coverage here). WikiLeaks has raised the alarm over the sudden disappearance of Arjen Kamphuis, a cybersecurity expert who helped journalists evade state surveillance. Speaking to Radio Sputnik, Peter Tatchell, an independent Wikileaks commentator and human rights campaigner, shared his views on the Kamphuis case and Julian Assange’s embassy saga. Another day, another questionable trademark dispute in the craft brewing industry. As we’ve discussed previously, the craft beer industry is undergoing an insane growth-spurt these past few years, with new breweries popping up all across the country. At the same time, the tradition of creatively naming breweries and brews is coming up against an erosion of the fraternal nature of the industry. Where once there was a sense of community among brewers that kept all but the most clear-cut trademark concerns at bay, the industry has since been inundated with trademark disputes between breweries. The trend has continued to the present, with Railtown Brewing deciding to sue a soon-to-be-opened restaurant and brewery to be called Railbird Taphouse and Brewery. Railtown Brewing Co. alleges in the case that Railbird Taphouse and Brewery’s name has already led to confusion in the marketplace, and “is likely to continue to confuse, mislead and deceive consumers,” according to documents filed today in the U.S. District Court for the Western District of Michigan. The Prespes Agreement – the latest attempt to end the quarter-century-long Name Dispute between Greece and its neighbour FYROM/Macedonia by renaming the latter ‘the Republic of North Macedonia’ – is back in the international headlines only three months after being signed by Greek Prime Minister Alexis Tsipras and his counterpart in Skopje, Zoran Zaev. The issue over the ratification of the Agreement had, through most of the summer, temporarily fallen from the top tier of public debate after Greece was deeply preoccupied with the tragic deadly fires that struck near Athens in late July, a mini-government reshuffle, and the country’s emergence in late August from the eight-year financial bailout programme. This changed on September 3 with the curiously-timed Wikileaks release of an American diplomatic cable sourced from the US Embassy in Skopje in 2008 asserting the then-hardline Macedonian/FYROM government could accept a name switching deal that is remarkably similar to what was agreed earlier this year, which served to deeply undercut what Tsipras has up-to-now portrayed as a major success. Rumblings over the cable’s significance continued in a series of tense exchanges between the main opposition party, New Democracy, and the ruling Syriza-Independent Greeks coalition. Arjen Kamphuis, a WikiLeaks associate and Dutch cybersecurity expert, has been missing for two weeks. The news of his disappearance was first made public when a friend, Ancilla van de Leest, posted on Twitter that he was missing and friends and colleagues were very worried about him, Huffington Post reported. Here is what you need to know about Kamphuis, his background, and everything we know so far about his disappearance. Norwegian police are investigating the sudden disappearance of Dutch citizen Arjen Kamphuis, a respected security expert and known associate of WikiLeaks founder Julian Assange. Kamphuis has been missing since since Aug. 20 and was last seen when he checked out of the Scandic Havet hotel in Bodø, Norway. Police confirmed on Sunday that an investigation involving the National Criminal Investigation Service, known as Kripos, had been opened into the disappearance by Tuesday. Kripos are Norway’s law enforcement agency specializing in technical and forensic level investigations, both finding missing persons and fighting organized crime. Norwegian police on Sunday said they were investigating the disappearance of WikiLeaks founder Julian Assange’s associate Arjen Kamphuis, a cyber security expert, who was last seen in northern Norway. It is noted that he was last seen on 20 August in the Norwegian city of Bodø, from where he probably went to Trondheim. “We started the investigation,” − said the Agency in the police, but refused to speculate about what could happen to a man. With all that is going on with Wikileaks and Julian Assange people are getting worried that maybe Arjen Kamphuis Wikileaks Associate has been victim to ‘foul play’. Amazon.com Inc. shares rose as much as 1.9 percent, pushing the company briefly beyond a market value of $1 trillion, a milestone Apple Inc. reached last month. The other two groups didn’t fare quite as well. Telling participants whether their neighbors were conservative or liberal kept the party gap alive—conservatives now did only slightly better than their counterparts in the control group. But surprisingly, the simple act of slapping donkey and elephant logos on the screen had the most detrimental impact. The results from both conservatives and liberals were indistinguishable from the control group. Comparing notes didn’t do a thing. There are two problems with the consumer welfare standard in 2018: first, after years of dancing around it, giant corporations and their lawyers have learned to make their arguments about price increases ridiculously technical. This leads to comical misdirection. For example, the judge in the AT&T-Time Warner merger case devoted hundreds of pages to the technical discussion of price increases and paid zero attention to the anticompetitive effects of AT&T prioritizing its own video services over others. Colombia’s Foundation for Freedom of the Press (FLIP) and Reporters Without Borders accused Colombia’s migration authority “collective censorship” on foreign journalists in Colombia by failing to expedite migrant visas. According to an investigation by Colombia Reports and The Bogota Post, at least 12 foreign journalists have been unable to obtain or renew the migrant visas that allow them to work in Colombia and could be forced to leave the country. Three other journalists said they had given up and already left the country. The accusations appears to be a consequence of the country’s “simplified” migration laws that took effect in December last year. Another day, another call for government intervention in free speech on the Internet. President Trump recently took to Twitter to decry supposed censorship of conservatives. He suggested that Google and “others” were censoring conservative voices and burying good news about him in search results. Furthermore, he warned that “this is a very serious situation” that will be “addressed” — perhaps with government action. Lawsuits against institutions that transmit speech, such as newspapers and blogs, impose costs that those institutions act to avoid—if necessary, by preemptively censoring any third-party speech that increases their exposure to legal liability. The purpose of Section 230 of the Communications Decency Act is to prevent this collateral chilling effect, specifically on internet users’ speech. CDA 230 enables the dismissal before trial of suits seeking to hold websites of the user-driven content model, such as Twitter and YouTube, liable for the unlawful speech or conduct of their users. This law is based on a policy judgment that, if held liable for all illegal content within millions of online posts, websites would reduce the amount of speech they transmit and, erring on the side of avoiding legal costs, would censor some lawful speech. But even unsuccessful suits impose costs—after all, defendants who dismiss a suit before trial on CDA 230 grounds still must hire a team of expensive lawyers to secure dismissal. An empirical study in 2012 by Professor David Ardia at the University of North Carolina determined that the average CDA 230 case terminated on a motion to dismiss takes almost a year to reach dismissal. Ardia noted, plausibly, that litigating for this length of time entails substantial defense-side costs. In order to mitigate the collateral chilling effect of these pre-trial costs, defendants in CDA 230 cases need a fee-shifting mechanism that allows them to impose their costs on plaintiffs whose cases have faltered at the motion to dismiss stage. Given likely political obstacles to adding a fee-shifting provision to CDA 230 itself, a good way to supply this mechanism is through federal anti-SLAPP legislation. The I&B advisory urges channels that they may refrain from using the term ‘Dalit’ while referring to people belonging to Scheduled Castes. New Delhi : The Congress on Tuesday dubbed as “censorship” the advisory of the Information and Broadcasting Ministry asking TV channels to refrain from using the nomenclature ‘Dalit’ for people belonging to Scheduled Castes. Congress spokesperson Manish Tewari also hit out at some television channels supporting the government’s move, and asked them to introspect. The Congress on Tuesday termed “censorship” the Information and Broadcasting Ministry’s advisory to the media to avoid use of word “Dalit”. Congress Spokesperson Manish Tewari said such terms are commonly used in public discourse. “If the government ordains or the Ministry ordains that the language which you use in your reportage should also be one that is pre-cleared by them. “How else will you characterise this advisory except to call it censorship? And my request to all those media outlets, who have been supporting the spectre of censorship, that they should introspect. When you sow the wind, you reap the whirlwind,” he added. The world’s largest social media companies defended their decisions not to censor primary-source document publisher WikiLeaks, telling senators Wednesday the organization has done nothing that would justify being muzzled. Sen. Tom Cotton, R-Ark., extracted corporate explanations after calling WikiLeaks a “non-state hostile intelligence service” at an open hearing of the Senate intelligence committee. Sheryl Sandberg and Jack Dorsey, high-profile executives at Facebook and Twitter, agreed during a Senate intelligence committee appearance on Wednesday that the abuse of personal information on their platforms had become a national security priority. Sandberg, chief operating officer at Facebook, and Dorsey, the founder and chief executive of Twitter, were both called to provide expert testimony to the committee over alleged foreign influence operations and the impact of social media platforms on the U.S. political system. Responding to a question by Senator Ron Wyden, both social media executives agreed that personal data had become the “weapon of choice” for political influence campaigns. “From this point on, beefing up protections and controls on personal privacy must be a national security priority,” Wyden posited firmly. “Yes,” said Sandberg. “Yes,” replied Dorsey. Facebook has determined that the whistle-blowing organization WikiLeaks does not violate the platform’s terms of service and it is allowed to keep its social media account, Chief Operating Officer Sheryl Sandberg said during a congressional hearing on Wednesday. Senator Tom Cotton, who inquired about WikiLeaks’ account, noted that Secretary of State Mike Pompeo has characterized the organization as a hostile foreign intelligence service and the Committee agreed with this determination. Facebook’s definition of what constitutes “terrorism” is “overly broad” and risks leading to censorship and the arbitrary denial of access to its services, a UN rights expert warned on Monday. We’re highlighting examples from our Facebook political ad collection that are interesting because of how they’re targeted, what they say or how they can help explain how Facebook’s advertising system works — and how it can be gamed. The Criminal Fraud and Abuse Act (CFAA) is intended to punish people for breaking into computer systems. Yet Manning didn’t break into anything. Instead, she was found guilty of violating the CFAA for using a common software utility called Wget to access a State Department database—a database she was generally authorized to access—in violation of a computer use policy. The policy prohibited the use of unauthorized software, even though the prohibition, which covers everything from computer games to simple automated Web browsing tools like Wget, is rarely enforce by the chain of command. Prosecutors have argued that Manning’s use of the Wget software violates the law’s provision again intentionally exceeding “authorized access” to a computer connected to the Internet. On Wednesday, the House Energy & Commerce Health Subcommittee will consider the EMPOWER Care Act, bipartisan legislation to re-authorize the Money Follows the Person program, which helps people with disabilities move from institutions into the community. MFP is little known outside of the disability community, but it has been an extremely successful Medicaid program that has helped over 75,000 people with disabilities from 47 states leave institutions and move back into their own homes. It was enacted in 2005 with strong bipartisan support. MFP was designed to help states transition people with disabilities from institutions into the community as well as to increase access to home- and community-based services. As executive director of the New York Association on Independent Living, which administers the state’s MFP program, I’ve seen the program do wonders for people. Unfortunately, the program expired September 30, 2016, and states are running out of funding despite the work left to be done. Congress must provide funding for this important work to continue. At a time when journalists face unprecedented attacks, Congress is now considering legislation that may make it even harder for them to do their jobs. Earlier this year, Sens. Ron Johnson (R-Wis.) and Claire McCaskill (D-Mo.) introduced legislation that would grant the Departments of Homeland Security and Justice enormous power to intercept, surveil, seize, and even destroy privately owned drones in a wide array of circumstances without ever once requiring approval from a judge. That alone is reason enough to oppose the bill. However, the bill may also impinge on the First Amendment by allowing the government to prohibit drones from being flown in a wide range of areas, including those where individuals may have a legitimate First Amendment interest. Since 2015, when drones were first commissioned for press use by the federal government, media organizations have found new and innovative ways of incorporating drones into their reporting. This new style of journalism, or drone journalism, has enabled media outlets to gather information in often inaccessible locations and obtain groundbreaking reporting. However, under this bill, journalists and others could be prohibited from flying drones where there is a legitimate public interest in gathering information. Chicago police officer Jason Van Dyke is charged with several crimes, including first-degree murder and aggravated battery, for killing a black teenager named Laquan McDonald in 2014. Van Dyke, a white officer, finally goes on trial this week, with jury selection scheduled to begin September 5. The trial will likely unfold over several weeks. We’ve long cast a skeptical eye on the judicial theory of qualified immunity. Conjured out of thin air by the Supreme Court, qualified immunity cannot be found among the thousands of laws and statutes our legislature has created over the past couple of centuries. Qualified immunity raises an almost-insurmountable bar for plaintiffs to hurdle when alleging Constitutional violations. It’s not enough to provide evidence of violated rights. Previous court decisions on point must exist, and the court must have previously established [insert rights violation here] as a Constitutional violation for the plaintiff’s lawsuit to advance. This summation of the QI standard from Scott Greenfield may seem outlandish, but it’s actually not that far from the truth. The complaint to the European Court of Human Rights (ECHR) with the case of terror suspect Abu Zubaydah comes two weeks after Lithuania’s representative at the ECHR said that the Baltic country would not appeal the court’s ruling since it was unlikely to be changed. The Lithuanian government has submitted a complaint to the ECHR over its May decision regarding the case of terror suspect Abu Zubaydah, who claimed that the Baltic country hosted a secret CIA prison where he was violently tortured, the Lithuanian Justice Ministry told Sputnik on Monday. To be very clear there’s no shortage of legitimate criticism aimed at giants like Facebook and Google for their inconsistent policies, repeated privacy snafus, and incessantly-incompetent public relations skills. That said, a large chunk of the push to “do something” about Google, Facebook and Twitter’s supposed assault on free speech is also little more than wet nonsense driven by people who don’t understand how the internet or First Amendment work. And a lot of the recent breathless hyperventilation in DC and vilification of “big tech” is being driven by the telecom sector, which has spent years demanding that their broken and uncompetitive monopoly market be mindlessly deregulated, while the healthier, more competitive online content and ad space face onerous new regulations. We’ve discussed at length how the telecom industry has grown bored with the slow, steady profit made from upgrading and running broadband networks, and has shifted its focus toward the sexier realm of online advertising. Granted, when large ISPs try to directly compete in that space they tend to fall flat on their faces, since running government-pampered monopolies has dulled their innovative and competitive edge. As a result, the Comcast/AT&T/Verizon version of “competition” usually involves two things they’re actually good at: cheating by distorting the playing field (aka net neutrality violations) and lobbying. A new research conducted by the researchers from Northeastern University and the University of Massachusetts, Amherst has revealed that wireless carriers are throttling the speed for popular video streaming sites such as Netflix, Youtube, and Amazon Prime. In one of its kind study, reported by Bloomberg, the researchers have used an application named Wehe which is downloaded by as many as 1,00,000 consumers. The app works by keeping track of the carriers throttling internet speed and for what services are speed throttled. The largest U.S. telecom companies are slowing internet traffic to and from popular apps like YouTube and Netflix, according to new research from Northeastern University and the University of Massachusetts, Amherst. The researchers used a smartphone app called Wehe, downloaded by about 100,000 consumers, to monitor which mobile services are being throttled when and by whom, in what likely is the single largest running study of its kind. We’ve noted for years how U.S. lobbying laws and restrictions are essentially hot garbage, and are routinely laughed at by some of the country’s largest corporations. The legal DC definition of a lobbyist was beefed up slightly back in 2007, when the Lobbyist Disclosure Act was notably amended by the Leadership and Open Government Act of 2007. Those changes required that if an employee spends more than 20% of their time lobbying, they have to register with the government as a lobbyist, detail their travel with lawmakers, and more fully outline their contributions to politicians and their myriad foundations. But many lobbyists responded to those changes by just changing their title or calling their lobbying… something else. We’ve examined, for example, how Comcast’s top lobbyist David Cohen shifted his title to “Chief Diversity Officer” in order to skirt around that 20% restriction. Cohen often can frequently be seen holding press junkets heralding Comcast’s altruism because it offered some discounted broadband connections to the poor to get its NBC Universal merger approved. But the lion’s share of Cohen’s time is spent lobbying local lawmakers during these junkets. The US Federal Trade Commission (FTC) has asked District Judge Lucy Koh to rule that semiconductor company Qualcomm must license its wireless standard-essential patents (SEP) to competitors. The FTC filed its motion for partial summary judgment at the US District Court for the Northern District of California, San Jose Division, on Thursday, August 30. Qualcomm’s competition dispute with the FTC is due to be heard at trial in January 2019. However, four months before the trial is due to commence, the FTC has asked the court for partial summary judgment that, under the fair, reasonable, and non-discriminatory (FRAND) licensing obligations Qualcomm committed to when it participated in setting wireless standards, Qualcomm must license its SEPs to rival chip makers. Whatever will we do without the Monkey Selfie case rearing its not-actually-copyrighted head every few months? We might finally get to find out, now that the Ninth Circuit has declined to rehear the appeal en banc. This denial now makes clear that monkeys lack standing to sue for copyright, at least within the Ninth Circuit. Someday (hopefully not soon) we may find out what other Circuits have to say about primate copyrights, but for now we can finally be confident that they lack standing to sue over them here. A lot has been written about the danger the planned EU copyright reform poses for freedom of speech online, for memes and remixes, for software developers and startups. Below, my colleague Dan Dalton and I draw attention to another group that would be badly affected by the planned law: Sports fans across Europe. Over the past several years, hundreds of thousands of piracy warnings have been sent out to Canadian pirates under the ‘notice-and-notice’ scheme. While these warnings are generally without consequence, several movie companies have also taken thousands of alleged “John Doe” pirates to court, demanding hefty settlement payments. THE USPTO had improved for a number of years, but then came Iancu, whose firm had worked for Donald Trump. Trump put him in charge of the USPTO, perpetuating the very Trump-like culture/pattern/hallmark of “vendor capture” (more commonly known as “regulatory capture”). The “vendor” in this context is the patent microcosm. “Trump put him in charge of the USPTO, perpetuating the very Trump-like culture/pattern/hallmark of “vendor capture”.”Yesterday the CCIA‘s Patent Progress wrote something which echoes what we’ve been saying for a long time: “Further Evidence That Examiners Can Be Incentivized To Improve Patent Quality” (as they should). Patent Progress has previously covered the research of Profs. Wasserman and Frakes regarding structural incentives at the USPTO that affect examiner behavior. A new paper in the AIPLA Quarterly Journal, written by Eric Blatt and Lian Huang (both former examiners), examines another area in which examiner incentives affect behavior—the Signatory Authority Review Program. Levy’s all-time low was probably the time he wrote for Watchtroll, a site of patent extremists. Here’s an example from yesterday, “The Death of Invention” (patents and invention are not the same thing and patents are not dying, they’re merely improving). Will he even last that long? 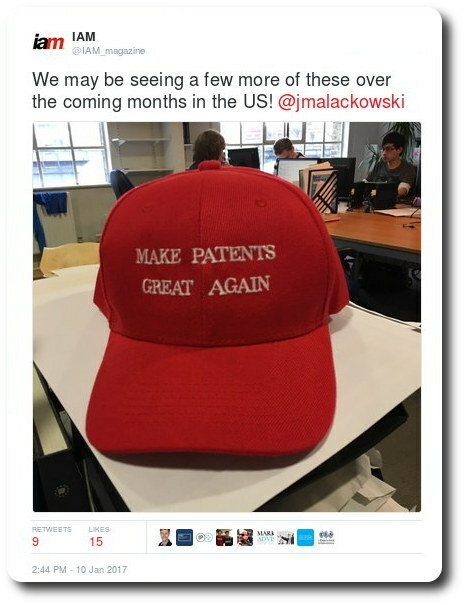 It certainly does not look like technology companies (prolific applicants) like him, but based on this new tweet, the patent trolls’ lobby is happy to see such a patent ‘industry’ actor in charge of the Office. “Iancu has made a very encouraging start at the USPTO, says 3M’s IP chief,” IAM wrote. He's a patent maximalist, just like IAM which routinely gives him a platform. …a recent letter from four German law firms, Grünecker, Hoffmann Eitle, Maiwald, and Vossius & Partner, argued that the “incentive systems and internal directives [at the office] appear to be directed towards rewarding or even requesting rapid ‘termination’ of proceedings and a correspondingly higher productivity”. It said that while the law firms do appreciate the increased speed, such “overreaching desire” for high productivity has led to a range of problems, including issues of quality, scope of protection, and inadequately assessed patents. While it is now led by ex-EU IP Office (EUIPO) executive director, António Campinos, over the past eight years, the EPO has been helmed by Benoît Battistelli, a controversial figure who is credited with bringing in a record number of patent grants year-over-year. This feat was said to be down to efficiency measures brought in under his reign. This, our sources explain, is coupled with “far too high production targets” which “obviously deteriorates the quality of products delivered as the four major German law firms rightly pointed out recently”. For staff at the EPO, there is still a long road ahead, and as the debate over quantity v quality persists, it is uncertain whether direct change is on the horizon. For Campinos, there remains the shadow of Battistelli and the uncertainty of the future.